Tell whether the design had separate spaces, a defined point of entry, a clear path system, and sun and shade variety. Discuss how any structures, the designated seating, eating, or parking areas suited the overall design. Identify five shrubs, five trees, and one ground cover, being sure that you select examples of different shapes, sizes, and textures. With the help of your counselor or a local nursery, choose plants that will grow in your area. Bring pictures of the different planting materials or, if possible, examples of their branches, leaves, or flowers to a troop meeting. 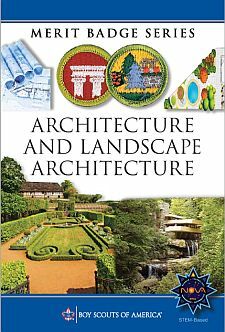 Be prepared to tell how you might use each in the design of a landscape. Using a measuring tape, measure and draw the main site entry and its nearby area. Define the scale of your drawing. Be sure to include the driveway and sidewalk or path that leads to the building’s main entry. Indicate any sidewalks, structures, trees and plants, lights, drains, utilities, or other site furnishings within the study area. Make two copies of this plan and save the original, then do 4b and 4c using the copies.
. On one copy of your site plan, use directional arrows to indicate where the water drains across the site, where ditches occur, and where water stands for a longer period of time.